Good article, Mark. Time will tell if the UK expansion will help bring B&N out of bankruptcy. Hi Ted. B&N is *not* in bankruptcy. Possibly you're confusing them with Borders, which went into liquidation last year? Was glad to read this newsletter today on the expansion into new areas! Good news for authors. I don't believe anything is ever too little, too late if the effort is made. That is especially true when indies will reap the rewards. Keep it up, Mark. We appreciate your updates! Yes, great news for Smashwords authors! ps I posted thisa little earlier and it came out as a comment on the Apple news.meh! I'm a UK resident & have seen the Nook adverts on tv the last few days.. It's good to know that B&N are now in the UK because next to Apple and Smashwords they're my biggest retailer. With any luck, we'll all see our sales increase over the next few months, and that's definitely good news! Excellent news for the UK. I have felt that we were sadly lacking in the e-reader market. 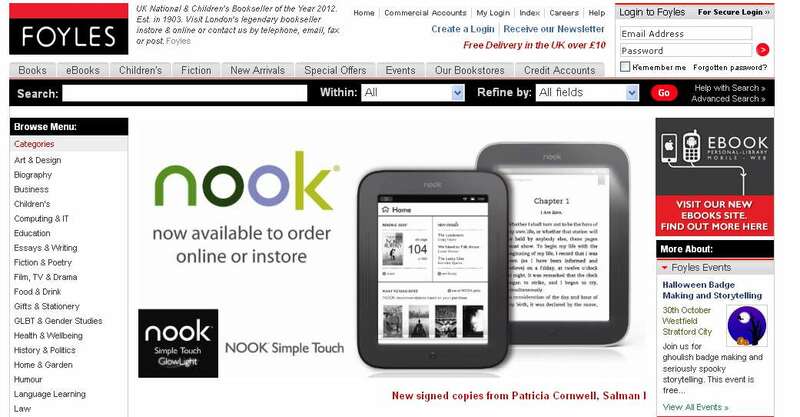 Expansion has come with a bang, especially as Waterstones are selling Kindle now. As regards the comment about all Smashwords authors getting onto the Nook, I have all my books in the Premium Catalogue, the last three or four without any blips/corrections in formatting. Your StyleGuide Mark is excellent and if followed, entry into the Premium catalogue is seamless. Thank you for all the work you do to help successful publishing and distribution. Nice article! Thanks for this news. I hope more ebook stores open all over the world. I really love the way you've written and composed all of the information in this article. It's so neat and clean work that any critic would love this work. Keep up the good work.